I leave bright and early tomorrow for a week in New Orleans, where I’ll be attending the annual conference of the International Association of Culinary Professionals. I’m on the board, so being at the conference is something of a command performance. But I’ve only missed one conference–San Antonio, for no particularly good reason–in the 16 years I’ve been a member. It’s a highlight of my year. Returning to New Orleans for this year’s conference is big in a number of ways. Topping the list is support of the city. Conference groups much larger than ours have been patronizing NOLA for months now, but I don’t know that a food-focused organization has made a major appearance yet. It’s our honor to be giving back to the community well beyond our hotel and restaurant dollars. Different sectors of the organization, from food photographers to cooking school owners, have devised ways to give back through a range of activities. As a whole, we hope to all encourage food lovers to return to New Orleans in support of those people working so hard to rebuild their lives. Anyone reading this who’s within a crawfish-toss of New Orleans might want to consider attending one conference highlight open to the public: our Gumbo Giveback on Saturday evening April 19, benefiting the Crescent City Farmers Market. For me, this is a nostalgic return to the site of my first conference as a member of IACP, back in 1993, which was also my first trip to New Orleans. I’ll never forget piling onto a bus for a pre-conference tour that took us into the surrounding region for a food tour. It was maybe 9:30 in the morning and we were all handed small paper bags of fried pork skin. They are serious about their food at any and all hours of the day in this part of the world! Our host was Paul Prudhomme, which was a huge treat. A phenomenal introduction to the area. Irene’s was a crazy-busy place, loud, bustling, too many bodies, not enough chairs. So frenetic I’m afraid I don’t much recall the dinner specifics. 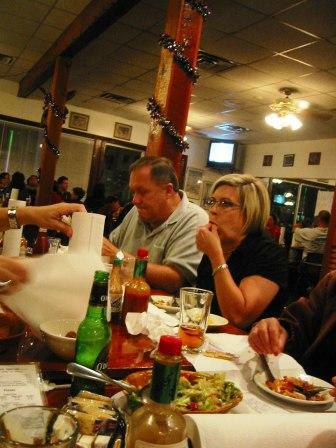 The next night we ate, thanks to deep-inside information, at R & O’s in nearby Metairie. So low on the radar, I can’t find a decent link to offer. No-frills, all the way. This photo gives you an idea. 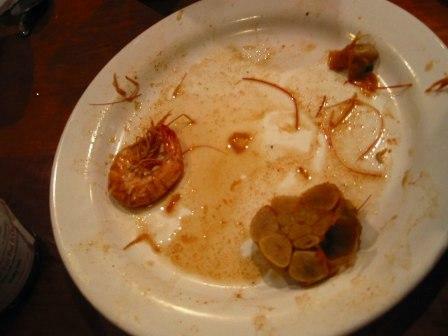 Napkins off the roll, baskets of saltines, bottles of Tabasco, eating with your fingers, deeply friendly service, pitchers of beer, an old boxy TV in the corner, amazing seafood (a nearly empty plate of garlic shrimp below). 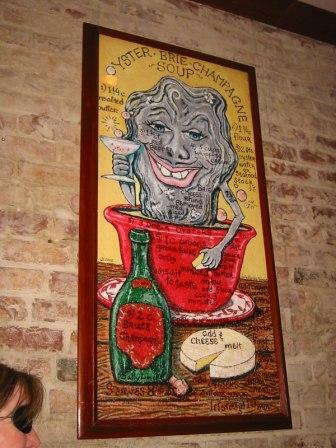 Ask a local once you’re in New Orleans and surely someone can steer you in the right direction. BUT, it’s important to ENUNCIATE clearly. 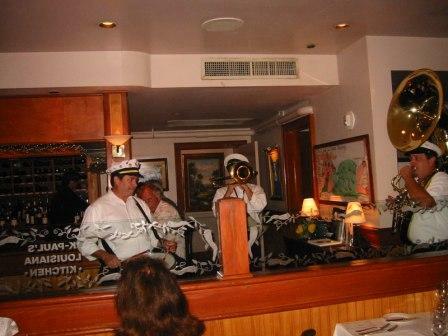 Or you’ll end up at Arnaud’s, a far fancier spot in central New Orleans where you’ll probably have to behave yourself. I would give anything to be able to share a couple of other photos with you from that trip, but nightime shooting outdoors just didn’t work out. We walked one night to dinner at Irene’s after a reception at Bourbon House, both in the French Quarter. It’s like some civic stage manager yelled “cue the parade” as we wended through the streets. Out of nowhere came a marching band leading a crowd on a wonderful brassy march, tossing beads. Later on our way back to the hotel, we happened upon on a less touristy, far more arty parade that clearly was celebrating Day of the Dead. Large fabric and papier mâché figures, skulls, skeletons paraded through the quieter streets of the Quarter, bobbing gently to more somber but still spirited music, akin to that of a jazz funeral. It was mesmerizing. The city is still mesmerizing, surprising, delicious, delightful–if operating at some fraction of its earlier level of frenetic energy and joie de vivre. But it’s coming back. Long as we all continue to return to the city, those who live there can work toward returning to their lives, many of which so bitterly disrupted.